Andres Serrano is an artist of Cuban descent, known for his photos of corpses and the use of bodily fluids in his work. He attended the Brooklyn Museum of Art School from 1967 to 1969, and worked as an art director for an advertising firm before becoming a full time artist. He has been awarded by organizations such as the Society of Publication Designers (2000), the New York State Council on the Arts (1990), the Louis Comfort Tiffany Foundation (1989), the New York Foundation for the Arts (1987), and the National Endowment for the Arts (1986), among others. His works are part of several public collections, including the Institute of Contemporary Art in Amsterdam, Netherlands; the Baltimore Museum of Art in Baltimore, Maryland; the Institute of Contemporary Art in Boston, Massachusetts; the National Gallery of Australia in Canberra, Australia; the Art Institute of Chicago in Chicago, Illinois; the Israel Museum in Jerusalem, Israel; the Cintas Foundation in Miami, Florida; the New Museum of Contemporary Art in New York; the Museo Nacional Centro de Arte Reina Sofia in Madrid, Spain; the Whitney Museum of American Art in New York; and the Museum of Contemporary Art in Zagreb, Croatia. 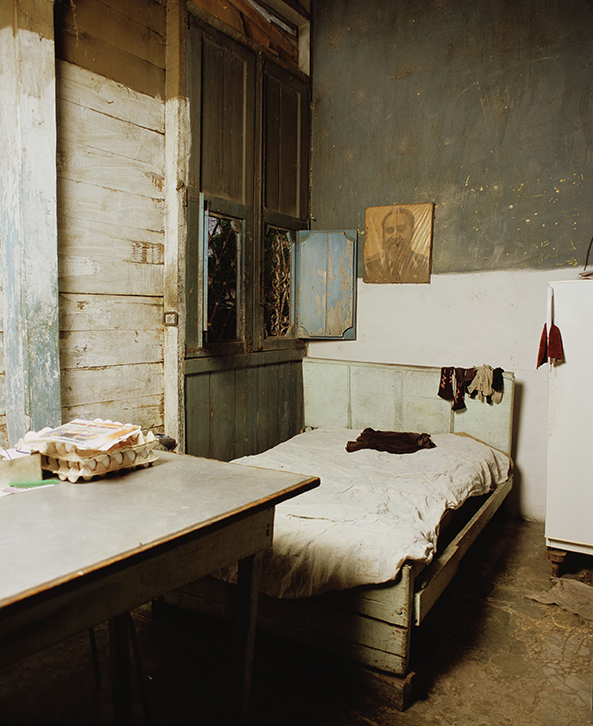 Cuba (Bedroom with Fidel), 2012. Digital C-print, 60 x 50 in. Ed. 3/3.